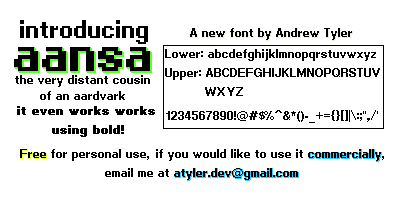 Best used at 12pt font, turn anti-aliasing off for other sizes. All fonts are free for personal use. For commercial use, including apps, a commercial licence is required. Upon payment of the nonrefundable license fee, AndrewTyler.net grants you a nonexclusive, nontransferable, limited right to use the Font Software according to the EULA, available at andrewtyler.net/fonts.